Well, it is almost time to move again. One day I think God will put me in a permanent place where I can put down roots. 1) My funny friend Keith Edwards, Registrar and Director of Development. Sometimes I wondered if I would get any work done! 2) My hard working co-worker Debbie. This place would fall apart without her! 3) My fearless boss Michael Haykin. I will never forget his laugh that you can hear a mile away, his stories of Marxist tendencies, a case of Mountain Dew, and the endless amounts of photocopying, editing, and running to the U of T I did for him! 4) My French friends, Pierre Constant and Ruth Labeth. They brought culture to our poor band of fellows here, even though we did tease them. Never let Keith translate for someone who speaks French! 6) Our part-time profs like Bob Penhearow, Stephen Yuille, Paul Martin, Leah Robinson, Sheila Evans, and anyone else I’m missing who brought variety to this place! 7) The powerful preaching of Glendon Thompson, pastor of Jarvis Street Baptist Church. 8) And of course all the students… from the hard workers who had stimulating conversation with me to the ones… who didn’t… who spent more time talking about Metalocalypse than they did Traducianism! I will miss my role I had here, but obviously God has another place for me. I will not forget you all. You have all made an indelible impression on my life and I truly hope that we will have opportunities to minister together again one day (of course I’ll still be Michael Haykin’s lackey!). Many blessings this Christmas season! Please continue to pray for God’s place for me in ministry! Attention all Toronto Residents. Let me suggest to you that you seriously consider attending these upcoming lectures by D. A. Carson, Research Professor New Testament at Trinity Evangelical Divinity School being held at The Peoples Church January 27-30, 2008. Carson is an excellent speaker who I have been blessed to sit under on other occasions. This topic of the Cross and the Resurrection are of supreme importance to the believer and in fact is central to true Christianity. Also, Dr. Carson will also be speaking in the chapel of Toronto Baptist Seminary and Bible College on January 30, 2008 from 11:20 Am to 12:10 PM and is speaking on the area of “Issues in Contemporary Christianity.” Makes sure you are there for that as well! For more information about the Spiritual Life Convention their website here. Greetings to you 2 or 3 people who actually read my blog! I hope this Christmas season would be one that would draw you and your family closer to the Triune God during the time when the eternal Logos took upon Himself flesh to bear the sins of humanity. I thought it about time to give you another up-date. Tracy and I are doing very well despite the distance between us. The wedding is scheduled for July 26, 2008 and it will be Scottish themed. I’m going to wear a kilt! Don’t worry, I will post a picture of it for you all to see! Her background is the clan Fraser and mine is Lamont so we are making the wedding Scottish including shortbread, wildflowers, and hopefully a piper! Please continue to pray for the two of us as we grow in our relationship with one another and with our Lord. Tomorrow is my last day working here at Toronto Baptist Seminary. It is with mixed feelings I leave. Administration was never something I wanted to do long term, but I will miss interacting here with the staff, faculty, and the students. I love my family and will look forward to being with them, but I do hope it is only for awhile! I do trust the Lord would put me in the place of His choosing for ministry, and at the very least, get me a job until then! There are possibilities of ministering at churches in Toronto, Peterborough, Grand Rapids, and in New Jersey. Please pray that the Lord would make it clear to both myself and Tracy and to the church where the Lord wants us. Please pray for work in the meantime. Many of you know that I dropped out of the PhD program at the University of Wales due to funding issues. We are exploring another option which is to do the PhD at Leiden University in Amsterdam. They do not charge tuition to PhD students! I would most likely be changing focus from Andrew Fuller to John Gill and his response to Enlightenment thinking. This appeals to myself, Dr. Haykin (who would serve as a co-supervisor) and my potential supervisor at Leiden. We are in the beginning stages of the pre-application procedure and would covet your prayers. I think that about wraps it up folks. A lot of prayer is needed from you my friends. Please pray for the Lord’s will to be revealed to us in all of these areas. Here is another favourite ancient Christmas hymn of my fiance’s. Enjoy! 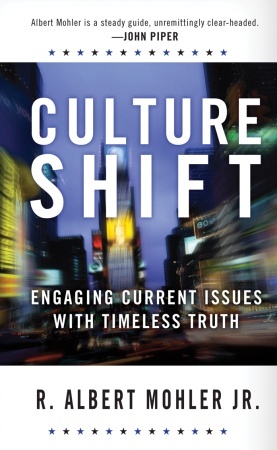 My friends, make sure you pre-order this upcoming book by Al Mohler on Christianity and Culture. It should be on your Christmas wish lists! See details below. Dr. R. Albert Mohler, Jr., is president of The Southern Baptist Theological Seminary, the flagship school of the Southern Baptist Convention and one of the largest and most influential seminaries in the world. A popular columnist and commentator, he has contributed to many leading newspapers including The New York Times, USA Today, The Washington Post and The Wall Street Journal. His daily syndicated radio program is broadcast on more than eighty stations nationwide. Time.com has called him the “reigning intellectual of the evangelical movement in the U.S.” Mohler lives with his wife and two children in Louisville, Kentucky. You are currently browsing the Working out Salvation with Fear and Trembling blog archives for December, 2007.